At the end of September we took another trip down to Truro to stay at Grandma and Grandpa's beach house. This time it was just us; the Bernsteins were otherwise engaged and the friends we invited couldn't make it. So we had the house, and the vacation, to ourselves. Which was novel! We realized, as we sat down to supper the first night there, that it was the first purely family vacation we'd taken since Harvey was a tiny baby, nine years ago. I think we earned it! Because it was well past Labor Day it wasn't only the house we had to ourselves, but pretty much the whole place. As soon as we arrived we headed right down to the beach, where we knew there'd be no trouble finding a place to set up our stuff. One reason we were interested in hitting the beach right away was the forecast: the Wednesday we drove down was mild, but there was cold weather predicted for Thursday and rain for Friday. So we had to seize our one beachy chance! Of course, while the air was mild the water was not; it took some effort to get in, even for Mama in her wetsuit. The waves also made it a little challenging, at least for the kids. This beach is on the bay side and is usually as calm as a pond, so the two-foot breaking waves felt pretty big. Most of us did make it in at last, and Harvey and I at least spent a good hour or so playing in the water. Pretty good for September 26! We needed some supplies for supper so after we dried off we drove into Welfleet to visit the wonderful grocery store there, with wood floors and shelves and a not terrible selection of things to eat. After stocking up we drove down to the harbor to take a walk. The evening light was beautiful, thanks to the gathering clouds. 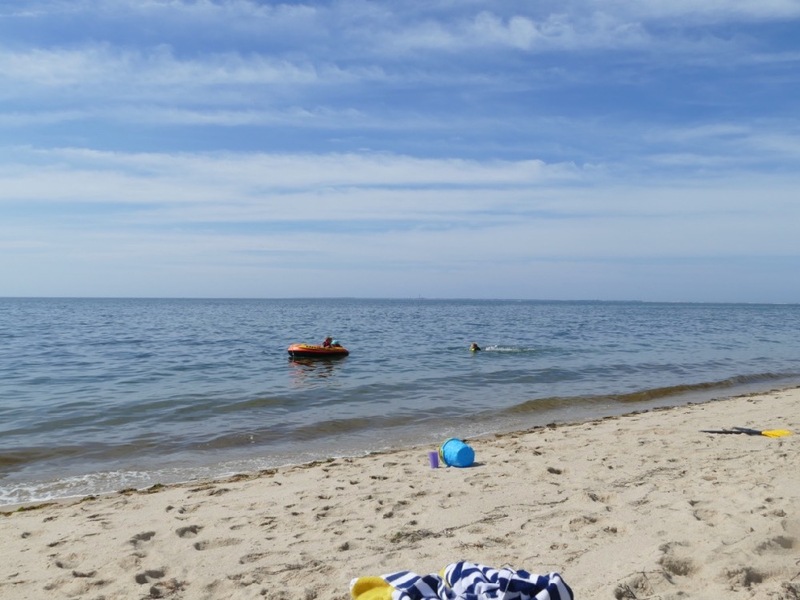 The clouds had settled in to stay when we woke up the next morning, which is why I told the boys not to pack swimsuits for our trip to Provincetown. I thought that made sense; besides the clouds it was windy and cold. We wanted to go visit Race Point Beach, where I assumed we'd walk a little, be impressed by the giant waves, and then look for somewhere warm to visit. I should have known better. You know how it is: they thought they were just getting their feet wet. It really was cold and windy, though, so we couldn't exactly swim, even leaving aside the fact that the waves probably would have killed us. Good thing swimming isn't the only fun thing to do at a beach! (I really wanted to do a flip off that bank, but it turns out that at 41 I don't have it in me any more.) So we jumped and walked and collected crab shells until the roaring wind—which made any non-shouted conversation impossible—drove us crazy and away. Done with the wind but not yet with the ocean, we drove a couple minutes to another beach on the other side of the point, which presented a completely different aspect: calm, quiet, and mild. With no waves to speak of we watched the tide not creep but race up the beach, and the boys had fun playing real-life Forbidden Island (while I forbade them to get their second suit of clothes wet). Next we visited Provincetown proper. The boys and I had a great time walking on the long long breakwater (pictured here) while Leah cuddled up with her book in the car to have a break from the wind. Then we tried to find somewhere to park to let us check out downtown, but even at the end of September the place was hopping. I don't go on vacation to battle for parking, so to the moans of the boys who had seen a plush Pikachu in a store window I pointed the car out of town. They were mollified when we found a quiet skate park to play in. Then we turned for home, but I wasn't totally done exploring and asked the family if they would mind checking out just one more beach. And they were glad they said yes, because Head of the Meadows was the best one yet. The sun had come out by then (as may be seen in the picture that tops this post), and though the wind was still at full force there was a big dip in the beach that blocked some of its force. And even better, the dip held a considerable pond. Which spelled the end for the second suit of dry clothes. I wasn't tempted by the pond, but while the boys frolicked I was watching the waves, and finally I couldn't resist. Fear of sharks kept me from really swimming, but I did go in enough to get my clothes—my only clothes, since I didn't think to bring spares—soaking wet. It was worth it. Then we headed home. Friday we woke up to steady rain. Leah wanted to get the house clean for a prospective renter who was coming to look at it, so I took the boys over to Welfleet to go to the library there. We'd wanted to visit it ever since we first noticed it last year, but who has time for libraries when there are beaches to visit! Except in the rain, of course. I'm glad it rained, because the library trip wasn't just a passable consolation prize, it was one of the best parts of the vacation. There was a giant collection of comic books, including the long-sought-out Hilo book 4, which absorbed Harvey and Zion; Lijah was delighted by the toys. An assortment of old cooking gear was his favorite, and he and I enjoyed imaginary play with the various strange objects. It was very cozy with the rain pouring down on the skylights. But we hadn't brought anything to eat, so at maybe 1:00 I dragged them away for lunch. Leah had packed everything up, so after lunch we said goodby to the house and headed home for real; stopping on the way, of course, for some ice cream. It's not a vacation without ice cream! Even Rascal got some. It was a good time. Family vacations are nice; let's do one again some day! It got really hot the middle of last week, so we were glad we had a cool place to go: Leah's parents' house on Cape Cod. It has a private beach. We left home Thursday afternoon, and it wasn't hot then; it was raining. The rain made for a dreadfully long traffic-plagued trip there, but we didn't mind too much. Mostly, we enjoyed the chance to chat, play with the iPads, or sleep, as appropriate by age and maturity level. Then when we got there we were treated to a terrific thunderstorm that passed just overhead. Luckily we were all unpacked before it hit. Friday day dawned coolish and hazy, but by mid morning the mist had cleared and the temperature was rocketing upwards. So we headed to the beach—the one just a couple minutes walk away, with no waves so even the littlest of us could feel comfortable swimming in the beautiful cool water. The only problem was we got a little carried away enjoying the sun, sand, and water, and by evening all five of us were suffering from some combination of sunburn, dehydration, and heat exhaustion. Good thing we'd had so much fun, so it felt worth it. The next day, after making solemn vows to drink water and apply sunscreen on a regular schedule, we split up: Leah and Lijah to spend more time at the quiet beach, the bigger boys and I on a cycling adventure to find some big waves. We drove a ways to the Cape Cod Rail Trail, with the thought of riding a segment to the National Seashore visitor center and thence on the bike path over the dunes to the Coast Guard Beach. I have fond memories of taking that trail as a young person myself, and wanted to introduce it to my own cycling boys. Missing the turn off the rail trail meant we had a couple extra miles at the beginning of the trip that we didn't need, but never mind; it would have been too short otherwise. Then we enjoyed a picnic lunch outside the visitor center before taking to the roller coaster of a trail to the beach. It was every bit as lovely as I remembered. Shorter, too. Those kids are better cyclists than I was at that age (Zion especially got lots of compliments as he powered his little bike up the hills). Before we knew it we were at the beach, where we joyously confronted the awesome waves. Actually, they were a little too awesome for the kids to engage with them fully. But they still had a lot of fun running and jumping in the wash of the breakers, and then making sand castles in a futile effort to hold back the fast-rising tide. Then to show that getting knocked over by waves wasn't so bad I put on something of a comedy performance, letting them have their way with me. I lost some skin but it was worth it! The water was a lovely temperature and the oceanside breeze was charming (as long as we avoided the deadly burning rays of the relentless sun). But of course we got all hot again on the ride home, so it was convenient that right where we had parked the car there was ice cream available. Back at the house we collapsed for a few hours: all that fun was hard work. But after dinner I had a little more energy and invited Leah out for a walk. That sounded good to everyone else too. The flies were too terrible to be anywhere but the beach, but the beach is always a fine place to be. Sunday we met up with some friends who were also staying in the area (we know them from church, so it was appropriate plan to meet them just in time to skip church together). We thought we were going to do a hike, but it was so blazing hot we couldn't manage it. Just like last time! But this time we had friends to share our complaints with, so they didn't seem so bad; and it seemed like a reasonable thing to do to just sit down by the water and throw some stones. The kids didn't have swimsuits; of course that didn't stop them from getting wet. The best part was we had already packed up the car, so with lunch over we could head straight home to Bedford. The traffic-free trip was smooth and easy, leaving the boys plenty of time to play with their friends in the neighborhood before bed. Now that's a vacation. It was wonderful. And exhausting. So now we're resting. Or trying to; it's close to 90° in the house right now. When can we go back? As I mentioned, we bought a canoe. Then we had to wait while we procured paddles, life jackets, and some means of carrying the canoe to the water (in the meantime we played with it on land). All those objectives were achieved by this morning, so in the middle of the day we took a trip out to Walden Pond to see if it floats. It does! We've been to the pond hundreds of times, but none of those trips were as exciting as this one. From the dangerously steep, rutted lane down to the boat launch and the violent rocking of the boat as Zion and Lijah stepped aboard for the first time it was clear that this was a new level of adventure. The smaller boys, who didn't have paddling to distract them, were pretty nervous at first; Lijah especially looked like he wanted to kiss the sand at our first stop, on the other side of the pond. There, the boys explored for a few minutes and we had a picnic lunch. After about half an hour of paddling all around the pond, though, even Lijah was starting to get used to the motion. Then, as the sun broke through the clouds, we completed our circumnavigation and approached the old familiar beach—but so different, seen for the first time from the sea! Also there was nobody else there. The boys ran around a lot and swam a little, while I lay in the sun and thought about how lovely it is to be alive (and also some about Pokemon). Then they put the boat back in the water and experimented to see how tippy it really is. It's pretty stable, actually, but if you really want it to go over it sure will! I think it made them feel a little bit better about this whole boating business. Harvey, certainly, was emboldened enough to try a short solo voyage of his own! Harvey tells me it was a the best adventure we've ever done. Here's to lots more—even better!—in the months to come.